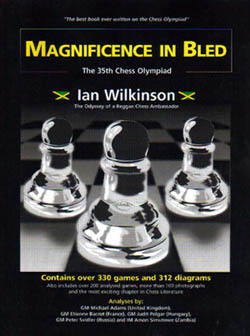 Wilkinson releases "Magnificence in Bled"
For the past two years, Ian Wilkinson has served admirably as the Jamaican Chess Federation President. Prior to becoming the island's "chess don," he served as team captain of both the men's and women's team at the Bled Olympiad in 2002. After Bled, Wilkinson was asked by The Chess Drum's Daaim Shabazz to write an essay about his experiences in Bled. The essay was titled, "The 35th Chess Olympiad in Bled, Slovenia through a Jamaican Microscope: A Fantastic Sojourn." This beautifully-written essay provided an omen of the idea pregnant in Wilkinson's mind. As everyone slept through the night, Wilkinson was busy plotting a course for putting Jamaica chess on the map. He embarked on writing a book not only about the Bled Olympiad, but about the tournament's entire history. This ambitious project was kept secret as Wilkinson charged forward. "I cannot explain it but I was driven to write this book after realising that there was a dearth of (printed) material on the Chess Olympiad and also because I wanted to chronicle the 2002 Jamaican experience for posterity. To answer your question directly, I am hoping that this book will bring Jamaican chess more into the spotlight or, alternatively, to put my country on the international chess map in a more meaningful way. My thinking is that this will make it easy (or easier) to attract grandmasters and/or serious chess people to Jamaica to play, teach etc. It has proven very difficult to expose our local players to strong international competition due to the cost of traveling etc. Perhaps, with more exposure (which this book could help to bring) more people will become knowledgeable about Jamaica and come here." After more than a year of hard work, hundreds of e-mail, countless trips to the publishers and… a few hurricanes, "Magnificence in Bled: The 35th Chess Olympiad" will be unfurled at the 36th Olympiad in Mallorca, Spain. In this handsome book features 33o games with over 300 diagrams and analysis by leading Grandmasters such as Michael Adams, Etienne Bacrot and Peter Svidler. In addition, Zambian star Amon Simutowe provided analysis on his key games. What is interesting about this analysis is that these star players did the analysis especially for the project and were gracious in their replies. Simutowe also traveled to Jamaica as a show of goodwill. This seminal work is the first of its kind in the Caribbean and arguably the most comprehensive work done on the Olympiad tournament. In fact, chapter two spans 80 years with historical commentary and 97 games, including many of the classic battles between chess greats… past and present. In addition, special chapters featured the games of Zimbabwe's Robert Gwaze (who scored 9-0 on board #1) and China's Zhao Xue who scored 11-1. Garry Kasparov's stunning performance is also highlighted as are his annotated games. With Wilkinson's entertaining style of prose and his certain passion for the sport of chess, he adds a much-needed boost to the beleaguered chess world. When viewing this handsome work, one can be easily impressed with the amount of effort expended by a sitting federation President! This book will represent the coming of chess through the ages and go where no other books have gone before. It stands as a diplomatic symbol of chess greatness, national pride and competitive spirit and will perhaps allow us to appreciate the activity that has, in large part, served as a life-enriching discourse. Wilkinson, Ian. Magnificence in Bled: The 35th Chess Olympiad (softbound); 412 pages, 330 games, 312 diagrams, 114 photographs (on 20 pages); foreword by Dr. Daaim Shabazz; introduction by Dr. Kevin Brown. Prices: US$24.99, €20.00 (euros) and Cdn$29.99. Note: Discounts ranging from 40-50% of the unit price are available for bulk purchases. Orders for the book may be placed with Ian G. Wilkinson at chevand@hotmail.com or with the publishers LMH Publishing at lmhbookpublishing@cwjamaica.com. "This looks and feels like a book. I am really proud." CEO of LMH Publishing (Jamaica), publishers of the book. "Beautiful. Muy completo (very complete)." Uvencio Blanco, President of the Venezuela Chess Federation. My Chess Olympiad collection is now complete." IM Almira Skripchenko, France's top female player. "This is a very good book"
"Nice. Thank you very much." Interested in this historic book? Please forward your name and e-mail address.